Habitat: They grows on different kind of stony and gravelly grounds where are very difficult to spot. Substrata mainly composed by yellow-brown fine-grained sandy shale; red-stained quartzite; brown amygdaloidal lava; dark brown dolerite. They closely resemble the surrounding pebbles of their natural habitat, either in colouration and shape, this camouflage allows them to escape detection and is a very effective strategy for escaping predation. They are pollinated by bees, flies, wasps, gnats, bugs and other insects that are common in the area. 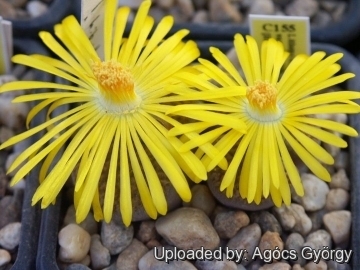 Description: Lithops hookeri var. 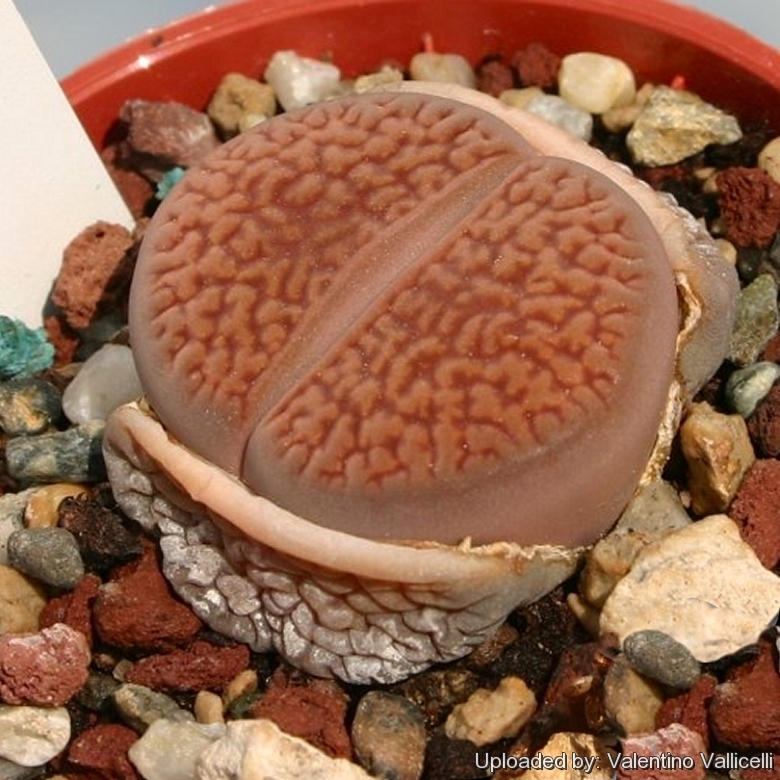 marginata is one of the many a controversial varieties of Lithops hookeri, but its varietal status is uncertain and some consider it only a form of the latter. It is distinguished from Lithops hookeri for the upper surface usually rust-brown, with olive-green windows and top part of surface slightly rugulose. However it is the more variable variety for face colours with a tendency to broader grooves which often widen into channels and open windows occasionally even into partially open windows. Desmond Cole field number C155 [red-brown form]: This population distinguishes for having pinkish rust top with few lines. Cultivation and Propagation: They need an open mineral, fast draining mix and the maximum amount of light you are able to give them. The basic cultivation routine is: Stop watering after flowering. Start watering after the old leaves completely dry. (Usually late March or Early April) Water freely during the growing season, soak the compost fully but allow it to dry out between waterings. Some growers fertilize frequently, some hardly ever. Keep them dry during the winter. Nearly all problems occur as a result of overwatering and poor ventilation especially when weather conditions are dull and cool or very humid.